Figures show fish farmers are using an increased number chemicals to kill sea lice found on salmon. The use of chemicals in Scotland's salmon farming industry has risen sharply, according to an investigation. Figures from the Scottish Environmental Protection Agency (Sepa) show fish farmers are using increased numbers of the chemicals designed to kill sea lice living on farmed fish. The BBC Scotland investigation reports that the range of these chemicals has also increased since 2005. The full findings are to be revealed in the programme Salmon: A Dirty War, on BBC Radio Scotland at 10.30am on January 30. The investigation shows the use of all veterinary chemicals has risen in the last five years, some by as much as 163%. Salmon production has increased by 11.3% since 2005, according to figures. The programme hears from campaigners who say the industry is losing control of sea lice numbers. They argue sea lice on farms leads to increased infestation levels on wild fish and contributes to the decline in stocks of wild salmon and sea trout. Guy Linley Adams, an environmental lawyer employed by the Salmon and Trout Association, said the figures backed up concerns about resistance to treatments. He told the programme: "There are examples in those reports of farms that were unable to control their lice problem and as a result the fish were culled early. "Now they've had a massive sea lice problem and they've had to cull early because the products they are using just don't work." 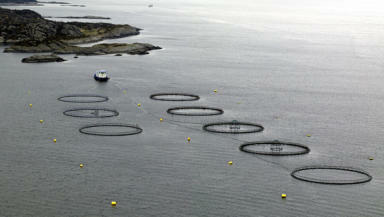 Mr Adams said early culling was happening on "no more than a handful" of fish farms. He added: "If that spreads - and we have a large number of farms just unable to treat their sea lice - we have an industry in crisis." The programme reports that the industry insists there is no evidence to link sea lice levels on fish farms with serious problems for wild fish at a population level. A statement from the Scottish Government said: "The reasons for increased use of sea lice medicines are quite complex and almost certainly due to a number of factors. "In order to be certain of the reasons, much more information would be required on where, when and how use has been made of sea louse medicines, but in general increasing use is not in itself necessarily a matter for concern." The programme also discovered campaigners are planning a bid to take a fish farming company to court over claims that sea lice levels have impacted stocks of wild fish. According to the investigation, the campaigners hope to persuade the court to force companies to move fish farms away from rivers and lochs that wild fish use to migrate. Andrew Wallace, of the Association of Salmon Boards, said the move had come because attempts to work with the industry had broken down. He said: "As a general rule I think the industry has not participated in those agreements in the spirit in which they were set up, and this is why we are now seeing some of these agreements beginning to fail and a rather harder and less compromising attitude from our point of view." However, the move has been dismissed by Dr John Webster of the Scottish Salmon Producers Association. He said: "I think working together has worked very effectively. I believe that working together is the future for wild and farmed salmon."